(CHICAGO) Katten Muchin Rosenman LLP announced today that 66 attorneys along with 26 of the firm's practice areas have been lauded as industry leaders in the 2018 edition of Chambers USA: America's Leading Lawyers for Business. Katten's highest rankings are in the categories of Real Estate and Real Estate: Finance, and the firm received an elevated ranking in Bankruptcy/Restructuring. Seven partners received the highest individual rankings possible in their respective fields: Michael R. Callahan (Healthcare), Chris DiAngelo (Capital Markets: Securitisation), J. Hayden Harrell (Real Estate: Finance), Daniel S. Huffenus (Real Estate: Finance), Alvin Katz (Real Estate), Floyd A. Mandell (Intellectual Property) and Laura Keidan Martin (Healthcare). Katten was ranked in the following categories in the Chambers USA 2018 guide: Banking and Finance, Bankruptcy/Restructuring, Capital Markets: Derivatives, Capital Markets: Securitisation, Corporate/M&A and Private Equity, Environment, Healthcare, Intellectual Property, Investment Funds: Hedge Funds, Litigation: General Commercial, Litigation: White-Collar Crime and Government, Media and Entertainment: Litigation, Real Estate, Real Estate: Finance, Real Estate: Mainly Corporate and Finance, Sports Law, Startups and Emerging Companies, Tax and Transportation: Aviation: Finance. Chambers and Partners' staff of full-time researchers prepares legal directories that assess and rank the world's leading lawyers according to their reputations among peers and clients. The US guide was first introduced in 2003 and ranks the leading lawyers and firms in an extensive range of practice areas throughout the country. 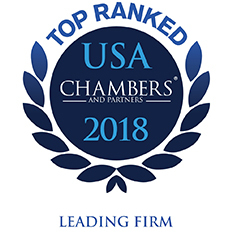 Chambers USA: America's Leading Lawyers for Business is read by industry-leading companies and organizations throughout the United States and worldwide, and is widely used by firms for referral purposes.